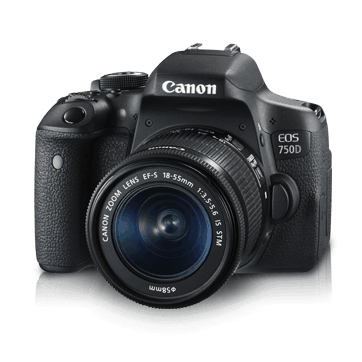 The EOS 750D features a 24.2-megapixel CMOS sensor, and is specifically designed for casual photographers who prize excellent image quality, a simple and user-friendly interface. It offers creative freedom through its new features – 19-point all cross-type AF and creative filters and the new Hybrid CMOS AF III. 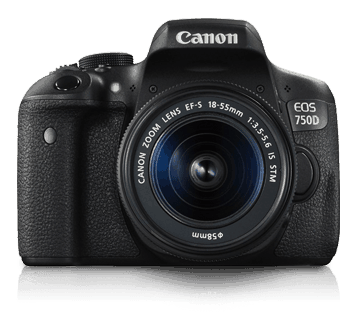 The EOS 750D features a stunning combination of the 24.2-megapixel resolution—the highest level ever in the history of EOS entry-level models—and the DIGIC 6 image processor which creates high image quality images that go beyond EOS entry-level model cameras. 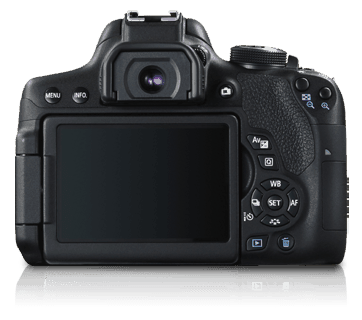 Hybrid CMOS AF III features rapid autofocusing in live view while shooting stills or tracking subjects during movie shooting even when subject is off center of the frame. In combination with touchscreen LCD panel, advance movie recording is made accessible even for entry users. * Vertical field of view in the 16:9 aspect ratio is approx. 93%. * With certain lenses, cross-type focusing at the peripheral AF points is not possible. Condition of AF point automatic selection AF point can be selected automatically in One-Shot AF mode, using information on colors equivalent to skin tones. Shutter Speeds 1/4000 sec. to 30 sec. (Total shutter speed range. Available range varies by shooting mode. ), Bulb, X-sync at 1/200 sec. Continuous Shooting Speed Continuous shooting: Max. approx. 5.0 shots/sec. Silent continuous shooting: Max. approx. 3.0 shots/sec. * Figures are based on Canon’s testing standards (3:2 aspect ratio, ISO 100 and Standard Picture Style) using an 8 GB card. * Figures in parentheses apply to an UHS-I compatible 8 GB card based on Canon’s testing standards. Recycling time approx. 3 sec. File Size Full HD (29.97p / 25.00p / 23.98p) (Standard): Approx. 216MB/min. Full HD (29.97p / 25.00p) (Light): Approx. 87MB/min. HD (59.94p / 50.00p) (Standard): Approx. 187MB/min. HD (29.97p / 25.00p) (Light): Approx. 30MB/min. VGA (29.97p / 25.00p) (Standard): Approx. 66MB/min. VGA (29.97p / 25.00p) (Light): Approx. 23MB/min. Focus method Same as focusing with Live View shooting. Remote control of the camera using a smartphone. Images can be sent to a smartphone easily. Print from Wi-Fi printers Images to be printed can be sent to a printer supporting Wi-Fi. Save Images to Connect Station Images can be sent and saved to Connect Station. View Images Using a Media Player Images can be viewed using a DLNA-compatible media player. Approx. 1hr. at low temperatures (0°C / 32°F)* With a fully-charged Battery Pack LP-E17. Dimensions (W x H x D) Approx. 131.9 x 100.7 x 77.8mm / 5.20 x 3.97 x 3.07in. (W x H x D) Approx. 33.0 x 14.0 x 49.4mm / 1.30 x 0.55 x 1.94in. 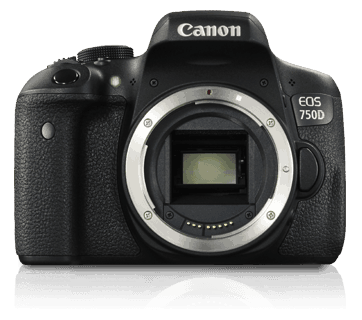 • All the data above is based on Canon’s testing standards and CIPA (Camera & Imaging Products Association) testing standards and guidelines.